Some days have been so long at the office, and it’s so grey and miserable outside that I just feel the need to treat myself with food- and by treat I don’t mean cake or sweets. I mean a really luxurious, rich, warming, delicious meal. But as times are tough a girl needs to keep a constant eye on the contents of her purse, so she cannot keep treating herself to restaurant meals and champagne willy nilly. As much as bubbles and lobster sound delicious, I actually really love cooking something delicious for myself and the Pal. So last night I did just that: I took a charming stroll through London Fields to the consistently excellent (if pricey) Fin and Flounder, and bought myself a bag of huge shrimps. In a large pan, heat a dash of olive oil and add the onion, carrot and celery. Cook on medium heat for around 5 minutes, then add the garlic cloves. Season with salt. Place the prawn heads and peel with the vegetables and sauté for around 5 more minutes. Add 750 ml of water and simmer until the liquid has reduced to around half of its original volume- this will take about an hour and is a good chance to start sampling the wine you will serve with it. When the sauce has halved in volume, it should be a pleasant orangey colour and smell rich and delicious. 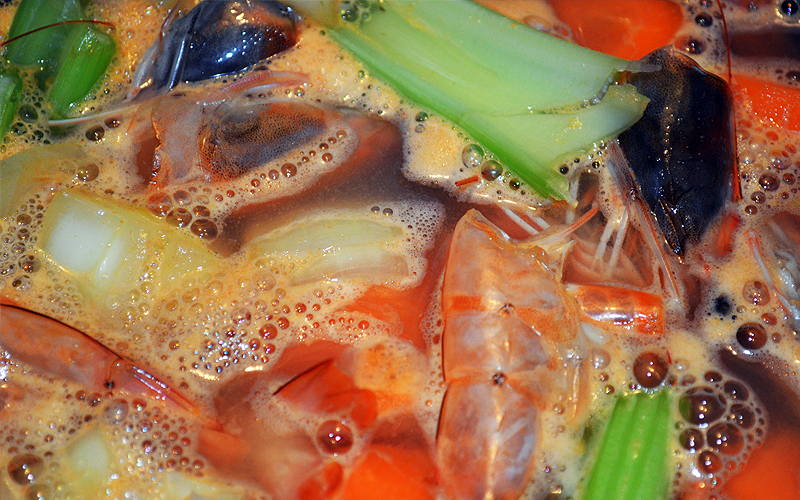 Strain the sauce- feel free to chuck the prawn remains and mushy vegetables straight in the bin. Add the fromage frais OR the cream, continue to simmer on very low heat until the sauce thickens. If the heat is too high, there is a chance the sauce will split, especially if you are using the fromage frais. Taste and season as required. Heat a tiny, tiny dash oil in another pan and fry the prawns until cooked, around 3 minutes. Meanwhile, cook the pasta as instructed on the package- I like mine al dente. 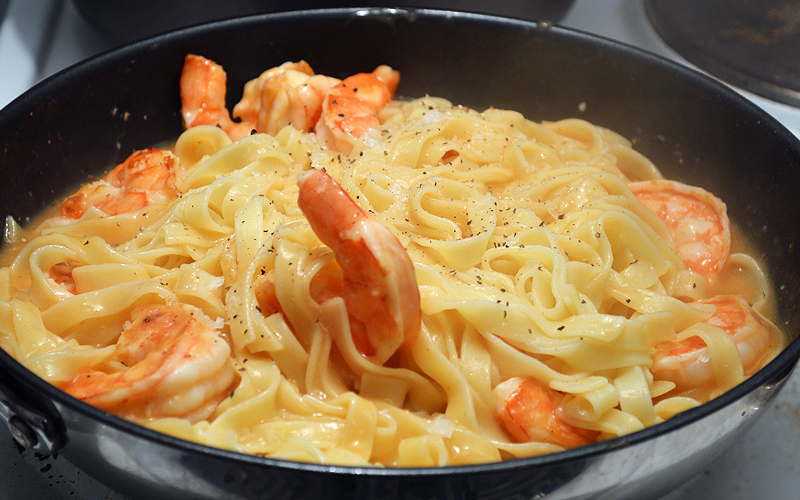 When cooked, toss the pasta, the sauce and the prawns. Serve and sprinkle with parsley. it really was! And pretty easy to make- if you can face veining shrimps at home!